Happy Saturday! First let me start by giving a HUGE shoutout to Missy from Gnarly Gnails for helping me make my blog look legit! Hahaha - she can personally attest to my poor ability to understand the intricate workings of making my blog look "pretty", but she really helped me out a lot. I hope you like it as much as I do! And best of all now you can find all the ways to subscribe to me in one neat location under my header just clicky clicky ;). 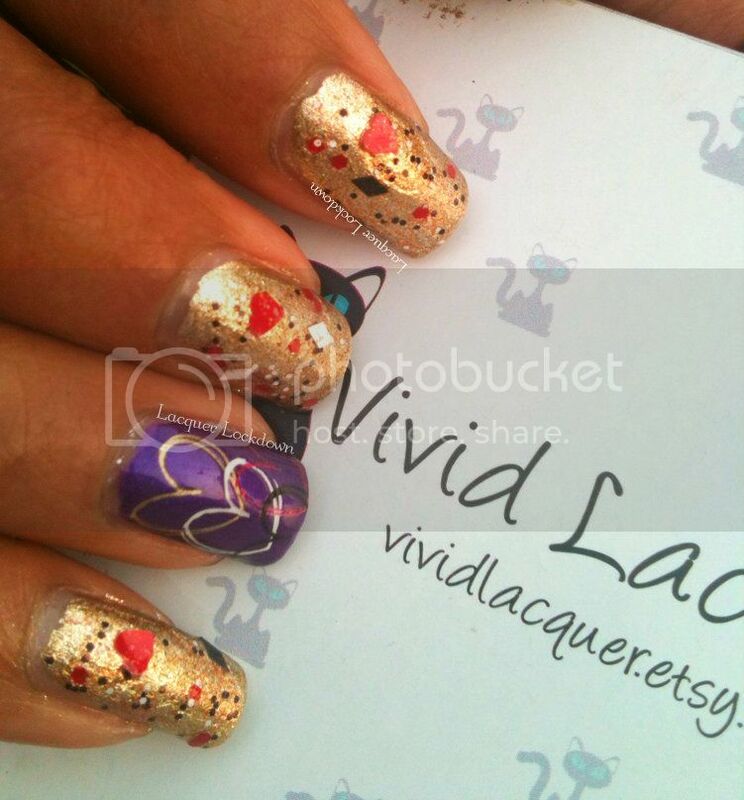 Alright today I'm going to be showing you some swatches of a few polishes from the indie brand Vivid Lacquer. You may remember me gushing about this brand once before when I first got her plates and then again when I did the duochrome butterfly mani. To date that is still one of my favorite nail art creations! Well I also had the pleasure of receiving three mini's from Anni the creator of Vivid Lacquer to test out for review. So let's get started! Formula (3 pts), Color (2pts), Brush/Bottle (1pt), Wearabilty/Durability (2pts), Ease of Application (2pts). This polish was inspired by the favorite colors of Anni's mom. 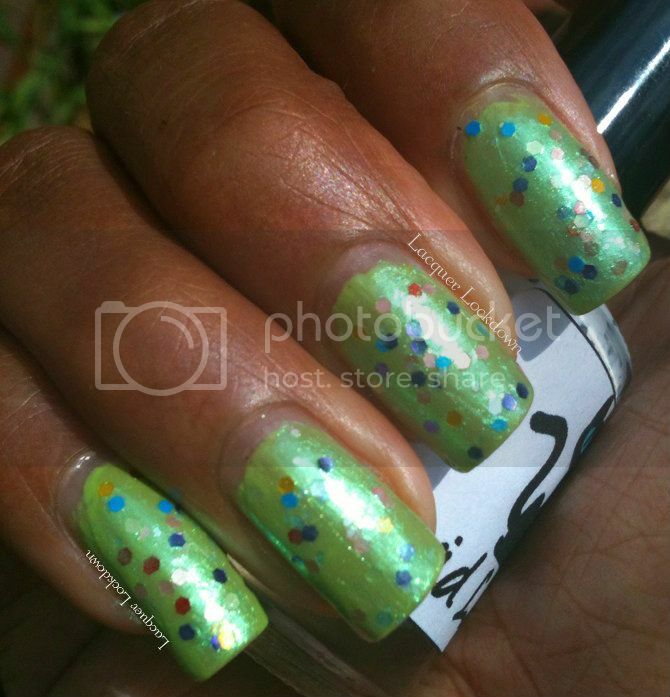 Waltraud is a shimmering pale green jelly base chock full of rainbow of matte glitter. I layered one coat of Waltraud over one thin coat of Orly's Green Apple. The Good: Damn this color is pretty! What wasn't apparent to me from the bottle that I quickly realized when it was on my nail is the darker green shimmer that caught and reflected light at certain angles. I kept looking down at my nails and then moving them about to see the shimmer. 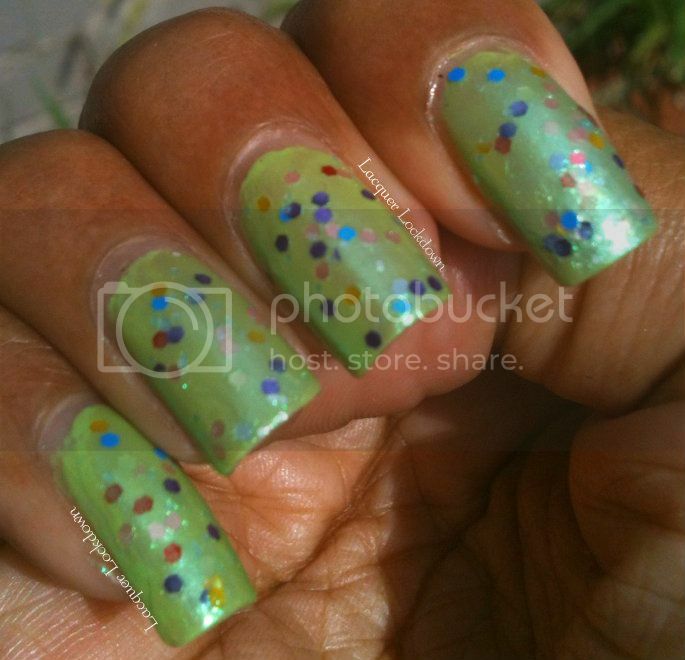 I also loved how the multicolored glitter added an extra punch of pretty to the manicure. The formula on this one was also excellent and I was able to get even coverage in one coat without fishing for glitters. To be honest this polish snuck up on me. I didn't expect to fall in love with the shade, but ended up walking away with Waltraud having stolen a little piece of my heart. The Bad: Perhaps only of minor note that the polish required a good shake beforehand to disperse the glitters that were settled toward the bottom, but this is typical for most glitter polishes and didn't pose any problems for me during the manicure. 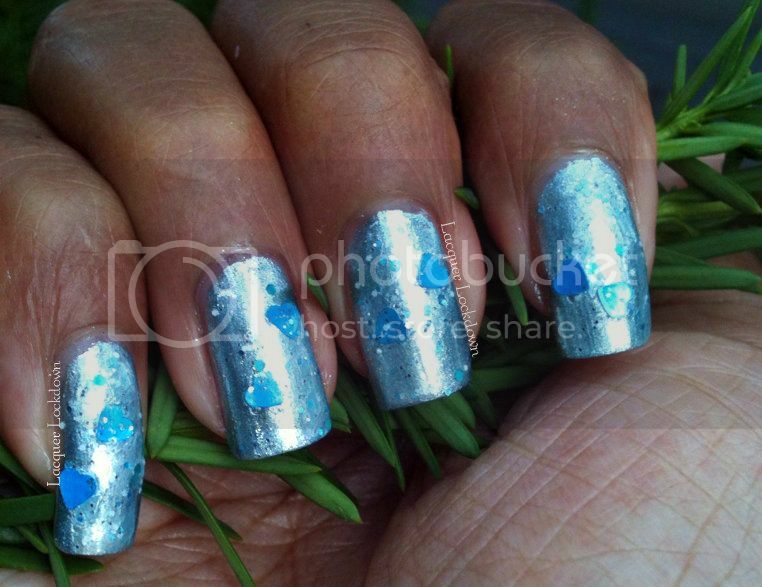 This is a pale blue frosty shimmer polish composed of blue jelly base, blue heart glitter, blue diamond glitter, and silver and white glitters. Here I have layered one coat of TIQL over one coat of Color Club's Luminescent. The Good: I love color of this polish to bits and pieces! I am a sucker for blues and with the fall and winter coming I like the idea of such a pale blue in my collection. Plus this kind of blue makes my skin look glowy and healthy which is huge WIN for me. The formula on this was also quite good. I was able to get the coverage I wanted in one coat. I had a bit of difficulty getting the larger heart shaped glitters out but turning the bottle upside down with a gentle tap solved the problem without too much of a hassle. The Bad: This is what I call a "tough polish" mainly because of the finish. I don't really enjoy frosts for a couple of reasons including that brush strokes inevitably show through giving your nails an uneven appearance. The one thing that really bothered me is the fact that the heart and diamond glitters didn't appear with the clarity that they should due to the frosted base overwhelming their color. 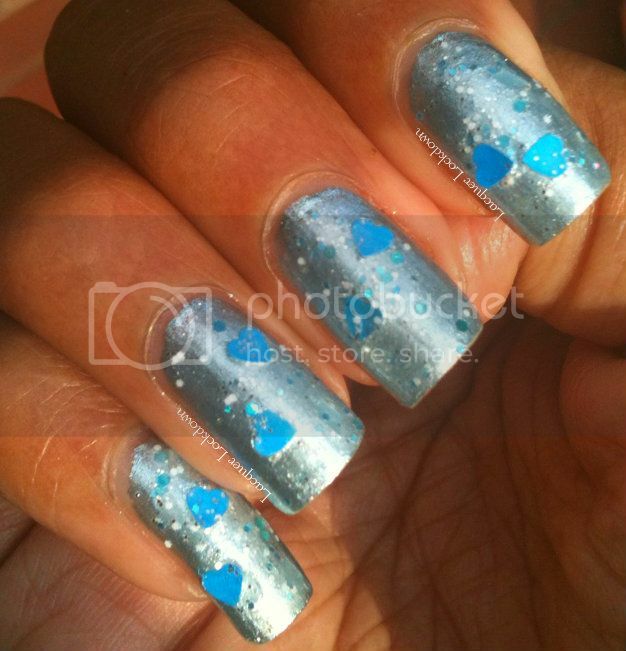 It was almost like the frost oversaturated the deep blue of the heart shaped glitters making it hard to see them within the manicure which was disappointing. This polish contains red and bronze flecks with black and white diamond, red heart, and fine black and white glitter in a clear base. I layered a little more than one coat using the dab method over one thin coat of Orly's Luxe. The Good: This was hand's down my favorite polish of the trio! It's so rich and fiery catching the light and bouncing all over the place. 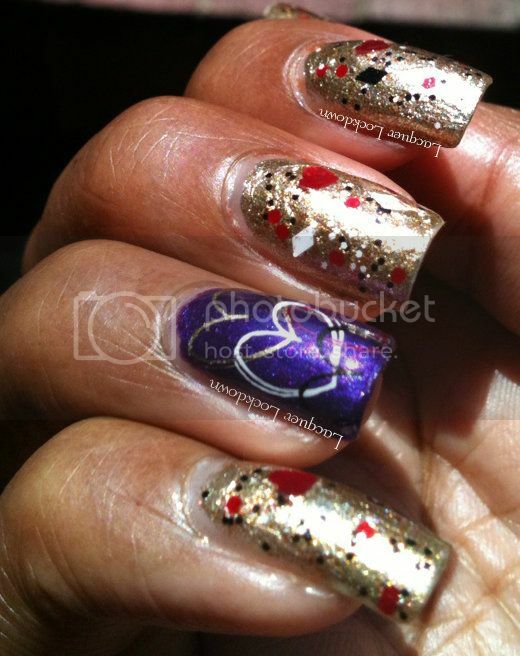 THA turns any polish it's layered over into an inferno and the heart shapes and diamonds add extra magic to the affair. Formula on this was excellent I had no need to fish around for glitters since the polish was packed full of glitter. While I ultimately chose Luxe to swatch this over I played with about 5-6 different undies and each of them ended up being super pretty. I added an accent nail to this swatch using A-England's Avalon and stamping with VL-001 heart pattern using the primary colors of THA (i.e. gold, red, white, and black). I love this one so much I'll be going back to get a full-sized bottle when I do another VL haul. The bad: It's worth noting that with THA less is more. Because this polish is so jam packed with glitter it's really easy to overwhelm the base color that your painting over. Dabbing with this one is definitely better than a full sweep over your nail as you would with regular polish. I don't even really consider this a negative aspect but it just means one has to be careful with application here. These polishes were provided to me for review by the manufacturer. For more information please see my disclosure policy. Love your new page layout looks great! Love the header! (I think that's what its called, not very comp savvy) lol Love the polishes as well! Great polishes and wow what a sick banner! I love it!! Hello darling! I love when you stop by and thank you so much for the nomination! I love the banner too! Missy is so freaking creative and it came out so beautifully I'm really grateful.